Most people are more familiar with the seaweed salad at Japanese restaurants, but there’s also a Taiwanese seaweed salad that is extra garlicky, with the tang of sweet and sour. At Taiwanese restaurants, I usually see this dish made with seaweed strips, which is how my mom started making it when we were kids. At some point, she decided to use seaweed knots instead and I liked it even more. It’s extra bouncy where the knot is and I get pretty addicted to the chewing of them. I realize that the seaweed knots may seem unfamiliar to some of you but they are so cheap at about $1.49 per pound (3 cups came out to $0.98), that it’s worth a shot right? Seaweed is so good for you too. You should be able to find it at most Chinese supermarkets, kept in large bins, soaking in water. Now that you are convinced, save this recipe as the perfect make-ahead. My mom used this dish a lot when she was preparing large holiday meals and she had to spread the preparation out for days. It has to be made at least 8 hours before you want to serve it, but then it keeps for at least a week. 1. 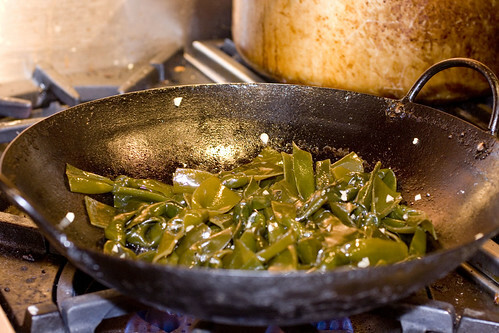 Heat wok over medium heat until just starting to smoke. Add oil and swirl to coat. Add seaweed knots and toss and stir for a few seconds. Stir in garlic. Add vinegar, sugar, and soy sauce, and toss and stir for another minute. Remove from heat and set aside to cool. 2. Transfer to an airtight container and chill in the refrigerator for 8 hours or overnight. Serve cold or at room temperature. Can be kept in the refrigerator for 1 week. posted by jessica	at 09:23 AM	Filed under Chinese, Recipes. You can follow any responses to this entry through the RSS 2.0 feed. Both comments and pings are currently closed. Jackie, it’s slippery but not slimy with a crunchy or snappy chewiness…much thicker and stronger than kimchee. well clever, not to mention eye-catching and attractive. i’ve never been so drawn to seaweed. These are neat, I would love to try if I can ever find seaweed. Btw, I made the zucchini boats yesterday and we loved them! The picture is in my camera, will send to you this weekend! Awesome Natasha! Can’t wait to see! The other use for seaweed knots is to throw ’em into all kinds of soy sauce based stews; think beef stew w/ carrots, chicken stew with potatoes, etc. It adds pure “umami” into a land animal based dish. 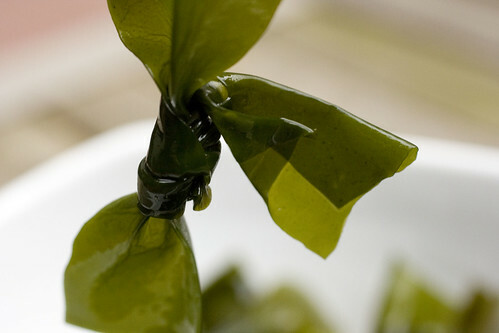 Soy sauce infused seaweed knots is like an umami 1-2 punch, an umami sandwich, or umami on umami love or… get the gist? And btw, after this post, I, tho quite happily taken, am officially in love with this jessica person. I Love the idea of this recipe. I will try it with our BC KELP wild seaweed at http://www.bckelp.com. I will try with the Kelp, Kombu and Macro. 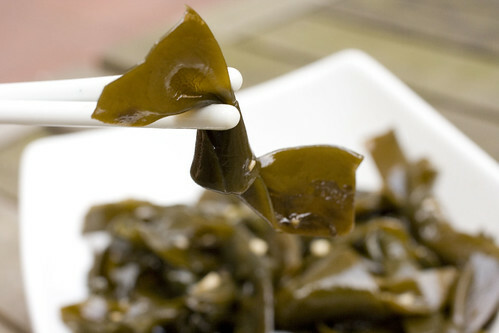 I know seaweed is very good for you so it is one of the odd things I have eaten more than a few times. I only say odd because the majority of my rather large family respectfully declines when I offer foods like… seaweed for instance. This is the first recipe that came up on the search page. I am so glad it did. Even though I only had apple cider vinegar on hand, I forged ahead. While I will be trying it again with rice wine vinegar real soon, this first batch was surprisingly tasty. Thanks for posting it. Thanks for posting the recipe. I have dried kelp knots, which are quite salty and strong. Would they work for this recipe, perhaps after soaking them? Liz, it’s worth a try. I’d love to know how it comes out!! Hello! 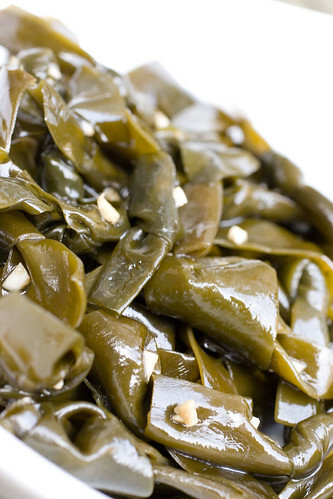 I went to an asian supermarket looking for kombu and was immediately drawn to the fresh kelp. At first i was excited because i heard of all the healhy benefits and thought it would be better than dried seaweed. But i am at a stop. I dont know if i CAN cook with fres kelp or have to dry it or something. Your advice would be greatly appreciated. Naomi, you can cook it fresh. I used fresh in this recipe.